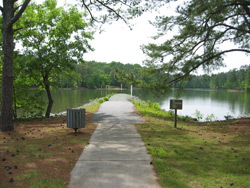 A city park located off of Proctor Landing Drive in Acworth, this is large and busy place that offers numerous amenities. 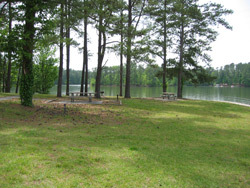 Proctor Landing features a swimming beach, individual picnic tables, two group picnic areas, a fishing jetty and volleyball and horseshoe courts. No alcohol is allowed in the park and you are not permitted to use any amplified music systems - and these rules apply even apply to anyone renting the group picnic pavilions. There is a $5 fee to enter the park and it is open from mid April to late September. Group Pavilions - The Pavilions are not rented on Sundays, Memorial Day, Labor Day or the 4th of July Weekend. Pavilion A is located adjacent to the lake. It can accommodate up to 100 people. 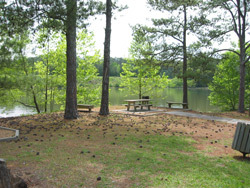 Pavilion B is large enough for 75 people and is located in a more shaded location that it set back from Lake Allatoona's shoreline. 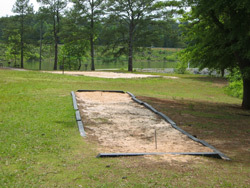 Prices vary from $75 to $145 dollars, depending on which pavilion is rented and if you are an Acworth resident. If you would like to find out more about facility rentals, you can call the city of Acworth at 770-917-1234 or you can visit their website. 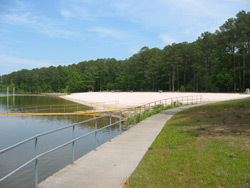 Two views of the swimming beach at Proctor Landing. A view of some picnic tables and pines on the left and a picture of the fishing jetty shown on the right. 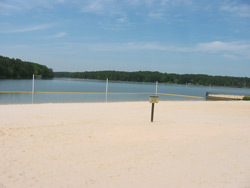 A horseshoe (left, foreground) and volleyball court (left, background) and a few of the picnic tables that are found along the shore of Lake Allatoona. 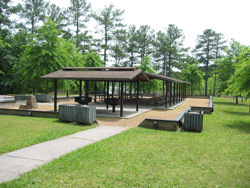 Photos of the group picnic pavilions that can be reserved, through the City of Acworth, for a fee. 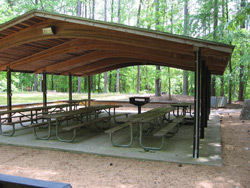 The photo on the left is the larger site (Pavilion A), which has two large barbeque grills under a separate covered roof (seen here just in front of the lager covered picnic bench area). Pavilion B is shown on the right.